WAR AND PEACE IN IRELAND retraces the conflict in Northern Ireland from 1968 up until the present day peace process. 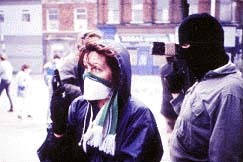 The principal events treated are the civil rights movement of the late 60's, the outbreak of a very long, costly war in 1969 and the birth of a peace process in the early 1990's that ultimately led to the IRA cease fires of 1994 and 1997; and to the current all party negotiations that offer the best chance for peace to the people of Northern Ireland in over a generation. The film explores the complexity of this conflict by the use of archival footage, and through the portraits of political leaders who have lived these events and who have played an important role in the search for a peaceful resolution to the apparently interminable Irish "troubles." The main protagonists of the film include: John Hume, leader of the moderate nationalist party the SDLP; Gerry Adams, president of Sinn Fein, the political wing of the IRA; John Taylor, leader of the Ulster Unionist Party - the principal loyalist formation; David Ervine, president of Progressive Unionist Party - political wing of the loyalist paramilitary organization the UVF; Albert Reynolds, former Prime Minister of the Irish Republic. Other major players treated with archive footage: former British Prime Minister John Major and the current Prime Minister Tony +Blair, and US President Bill Clinton. The point of view of the "ordinary" people on both sides of the conflict (nationalist and loyalist) is also an essential part of the film. For these people the Irish Question is hardly an academic issue; it is a question of war or peace, of life or death. What they have endured and how they see the future is a major theme of this documentary.